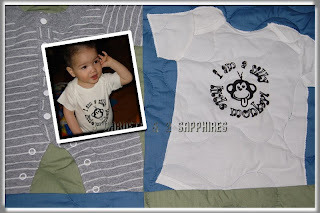 I have stated again and again that personalized gifts are probably the most cherished. Many of them become instant keepsakes that will remind the recipients of a special time in their lives and of the person who gave them that gift. In our case, we now have a family heirloom . . . a custom quilt that can be passed down from generation to generation. 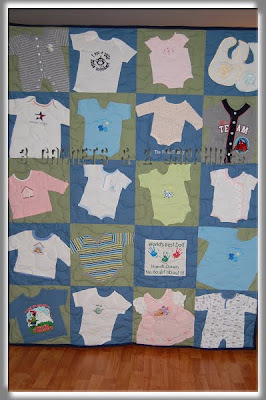 I chose a 20-square quilt and selected one Dad t-shirt that belonged to my husband and 19 baby items comprised of clothing my 3 children wore during the first year of their lives, including some preemie items. I also opted to have our family's name embroidered on one of the squares. 1) When we first opened the package and saw our finished quilt, both my husband and I were speechless. The quilt was so beautiful and pretty much summed up some of the most cherished moments of our lifetime . . . the first 12 months of each of our children's lives. 2) The ordering process was easy for the most part. 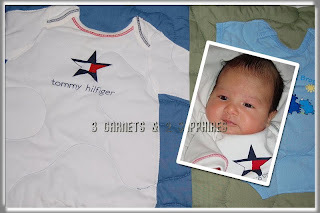 Each customer receives a quilt kit that includes a postage-paid mailer plus instructions on how to number your t-shirts or baby items in the order in which you would like them to appear. 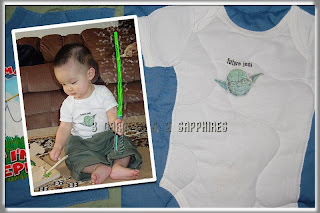 There are also options for sashing, embroidery, extra batting, etc . . . The kit even includes swatches for you to choose the color and type of fabric you would like to be used in creating your custom quilt. For me, the most difficult parts were choosing which baby items to include and what colors of fabric to use for our quilt. 3) I was very impressed that someone from Campus Quilt Company called me personally to ask a few questions. Since this product is so specialized, it was much better to speak directly to someone rather than communicating through email. The person I spoke with was extremely helpful. Not only did she have questions for me, but she also offered suggestions (such as the alternating blocks of color), which ultimately made our quilt look that much better. 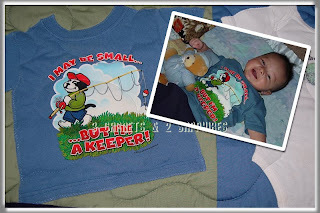 4) When I was choosing my baby items, I kept wondering how bulky this quilt would end up being. 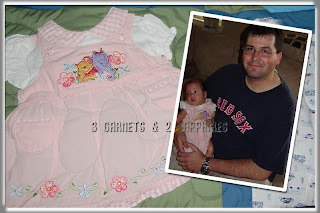 For example, my daughter's very first dress had some pleats, but it turned out not to be bulky at all. The technique the Campus Quilt Company used was to dissect the garment and to only use the front layer. 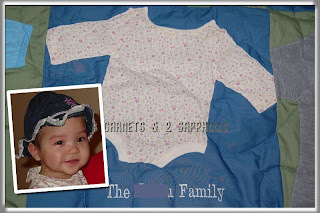 5) After receiving our quilt, I was much more comfortable donating the remainder of our baby clothes. They literally filled 30% of our attic space, but I could not bring myself to let go of them until now. 6) The turn-around time was quick! Even though there was the delay of those few questions, I received my custom-made quilt in about 2-1/2 weeks from when the company received my quilt items. 7) The communication on the part of Campus Quilt Company was excellent. I received a confirmation when my quilt kit was sent out, when my returned quilt kit was received, and when my finished quilt was shipped back to me. 8) I cannot finish this review without commenting on the amazing workmanship. There was not one crooked seam or one thread out of place. Take a look at why this quilt is so precious to me . . .
One cause for anxiety about a custom order, such as this quilt, is that you are trusting a stranger with your irreplaceable items. I cannot say enough about how pleased I am with our finished quilt. When I see this quilt, I smile, am flooded with beautiful memories of my children, and just feel like it is proof that my husband and I did something great together by building this family. To be able to make someone else feel like this would be an incredible gift. To learn more about these custom quilts, visit CampusQuilt.com . There you will surely find inspiration to create something special for a holiday, Mother's Day, Father's Day, or birthday gift or to mark a special occasion, such as an anniversary, a milestone birthday, or your child going off to college. The possibilities are truly endless. Thank you to Campus Quilt Company for providing us with both a review product and a contest prize free of charge. One lucky reader will receive a Quilt Kit and a $150 GC to Campus Quilt Company. Browse the various custom products offered by Campus Quilt Company. Then leave a comment telling me what one item (including the size) you would love to give or receive as a gift this holiday. You MUST do this to be eligible to win this contest. 3) For 10 extra entries, blog about this contest linking back to this post AND Campus Quilt Company. Then come back here and leave TEN separate comments with the link to your blog post. 4) Fan Campus Quilt Co on Facebook. Then leave a separate comment with the link to your Facebook profile. 5) For 2 extra entries, share the link to this contest post on Facebook, making sure to show the photo of the prize or the sponsor's logo. Then leave TWO separate comments with the link to your Facebook profile.